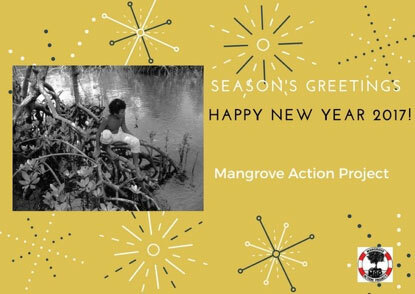 Yes, it’s the end of the year, and of course this is an appeal for your generous support for Mangrove Action Project! Since its inception in March 1992 (almost 25 years ago! ), MAP has been actively engaged in conserving and restoring the mangroves and people who depend on these unique and vitally important coastal ecosystems. With projects in Asia, Latin America and Africa, in collaboration with our local partners throughout the Global South, MAP has been building capacity of communities to protect and conserve these highly valued “roots of the sea” – the mangrove wetlands. Via our ongoing programs, we are striving to ensure that mangroves will remain to benefit the lives of future generations. In 2016, MAP continued to promote the vital role that mangroves play in carbon sequestration and long-term carbon storage; as coastal buffers against hurricanes, storm surges and tsunamis; and as critical nurseries for a cornucopia of marine life that depend on the mangroves. MAP furthered its Community-Based Ecological Mangrove Restoration (CBEMR) program in Thailand and Central America. Working closely with local organizations and communities, MAP’s CBEMR program aims to slow the rate of mangrove deforestation, improve biodiversity and provide ecological security by providing coastal communities with a series of practical and localized education and training workshops. Early next year MAP will be bringing CBEMR training to Burma, and there is growing interest in CBEMR in several other countries in W. Africa and Latin America. 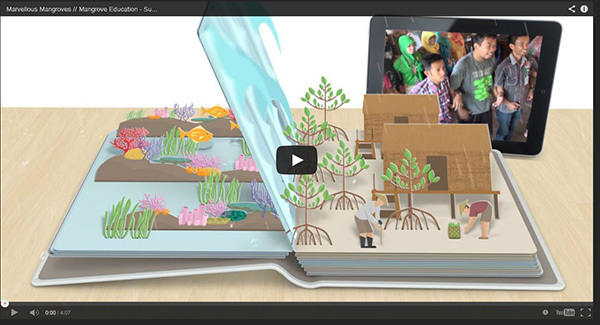 MAP’s Marvelous Mangroves Curriculum continues its focus on mangrove environmental education for primary school children. This program aims to educate future generations of mangrove stewards and decision makers about the critical importance of mangrove habitats. MAP’s Education Director Martin Keeley has thus far introduced the Curriculum into Cayman Islands, Guatemala, Honduras, Belize, Colombia, Brazil, Sri Lanka, China, Indonesia, Bangladesh and Australia. Martin recently took the Curriculum to Suriname, with further plans to bring this to Guadalupe, Haiti, India and Kenya in 2017. The Question Your Shrimp (QYS) Public Awareness/ Markets Campaign is still a vital part of MAP’s global campaign. A leading cause of mangrove deforestation still stems from the shrimp farm industry. With this in mind, the QYS project attempts to reduce mangrove loss by reducing demand in the northern hemisphere for farmed tropical shrimp. Networking remains an important function of MAP, and our world-renowned biweekly electronic MAP News has now been publishing mangrove-related news for over 20 years. 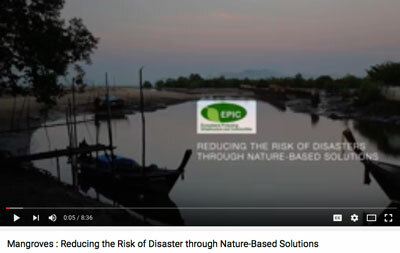 Over the years many environmental NGOs and mangrove ecologists have commended MAP for its newsletter’s informative and thought provoking content. MAP News continues to act as a key vehicle for MAP’s networking and advocacy work to defend the world’s mangroves. 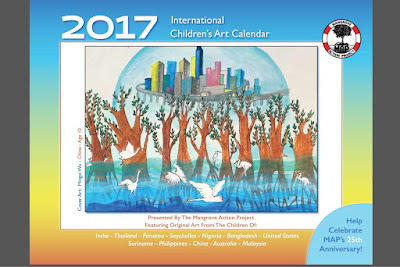 AND, of course, we must mention MAP’s 2017 Children’s Mangrove Art Calendar is in its 16th year of production! This year’s calendar is one of our most beautiful editions, and we are again offering the calendar as a gift for those donating $35 or more to MAP. Or, you can also purchase a calendar for $14, including postage. Please send checks to MAP, 606 Maynard Ave. S Ste. 102, Seattle, WA 98104, USA, or go online to MAP’s website to use PayPal to donate to MAP by credit card. 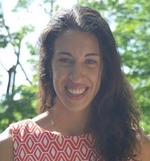 PLEASE DONATE TO MAP NOW before year’s end! Again, thanks so much for your support for MAP! In June 2016, a shrimp farm in Bangladesh was audited to determine its compliance to the ASC Shrimp Standard. Nijera Kori sent a team to monitor the audit, which was conducted by Bureau Veritas -- our presence is mentioned in the draft report (referenced below) submitted by the auditors to ASC. Our criticism of the ASC Shrimp Standard is well documented. However, our principle concerns at this stage are not the deficiencies in the ASC Shrimp Standard, but the manner in which audits (to determine compliance to the standard) are being conducted. The following are excerpts from Nijera Kori's report on the audit conducted at the shrimp farm with comments added after Bureau Veritas's draft report was published by ASC. 1) The party that initiated the certification process, Kuliarchar Sea Foods Cox's Bazar Ltd., ("the applicants"), own a shrimp processing plant. This business purchases shrimp from many farms in the locality; they also import unprocessed shrimp from Myanmar. The company processes the shrimp and exports it. The applicants do not own or run the farm that was audited; "Kuliarchar Shrimp Farm" is neither a brand name, nor a legal entity. The land in the area is administered by a local cooperative society, whose members own (individually or jointly) tracts of land in the area. The farm in question has been leased by its owners (till 2017) to a third-party, and NOT to the applicants. The lessee is not a farmer. The lessee is not the applicant. The lessee was not present during the audit of the farm which he had leased. a) The applicants readily clarified that they do not own or run any farms but claimed to be in possession of an agreement pertaining to the farm being audited. The terms of this agreement and its contracting parties are not known to us. The applicants REFUSED to show us a copy of this agreement. b) Members of the cooperative who OWN the land (whom we interviewed) were unaware of any lease agreement involving the applicants. More than one such interview is on record. c) One of the members said (on record) that the lessee is, allegedly, a local shrimp trader who deals regularly with the applicants. d) The report states: "Verified organization's farm contract with Badarkhali Shamobai Krishi Po Upaniwesh Samiti, signed on 27.12.2014." What organisation is this? Who are the parties that have entered into this contract with the named cooperative society? Who runs the farm? How can the applicants enter into a farming contract with the cooperative society without the knowledge of the owners of the farm? The auditors did not think it necessary to clarify these matters; they make no mention of these discrepancies in their report. Assessing various indicators under Principle 3 and 4 require the auditors to be certain about the legal identities of the farm, its owners and the people who work on it. 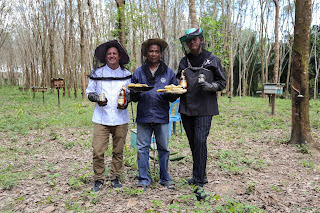 A number of aspects of third-party certification (e.g., chain of custody, workers's rights) are meaningless without clear identification of ownership, legal rights and responsibilities. If they were unsure how to proceed, they could have filed a Variance Request with the ASC. They did not. Instead, they bumbled their way through the audit -- their confusion is amply clear from their remarks on indicators under Principles 3 and 4. A contract is said to be in order, elsewhere the same contract is noted as incomplete; workers have a copy of the contract, then they don't have copy but that too is OK. Workers are alternately referred to as being on contract or employees of a "farm owner" or an "organisation." One can understand that a professional auditor, pressed for time, will be terse with comments and will re-use old material. However a degree of precision is expected and guaranteed -- especially on legal and technical matters. This audit report is a shambles; its errors begin on the first page. As such, the applicants are shrimp processors who source produce from a wide variety of farms. This raises a natural concern regarding trans-shipment, especially since a legal chain of custody cannot be established or enforced in this case. e) The audit report attests that "it is not easy for introducing product from outside the unit of certification." Our concern is NOT that shrimps will be added to the produce INSIDE the farm (the unit of certification) or during transportation. The real concern is that transshipment will occur inside the processing plant, which is conveniently outside the unit of certification. This is not the fault of the auditors, since the ASC Shrimp Standard exempts processing plants (even those on site) from inspections. Nevertheless, this statement in the audit report, among others, confirmed our suspicions (during the audit) that the auditors were trying to tick boxes without due diligence. The auditors made no attempt to inquire as to how the applicants would resolve CoC through the value chain in a manner that would enable them legally to use the ASC logo. These inquiries serve to help the client by informing them of their responsibilities. Let us be clear -- Nijera Kori could not investigate the matter of the contracts any further during the audit because the owners of the farm did not possess any contracts; the applicants refused to show us their copy of the contract; the lessee was not present during the audit; and the auditors couldn't care less. 2) None of the locals (who live beside or near the farm and were interviewed by us) were aware of the p-SIA (stated on record). None of them had ever met the applicants or their representatives or heard about a meeting conducted by the applicants. Indeed, it took us a while to connect the dots and locate the owners of the farm because nobody in the local community had ever heard of the applicants. Under pressure, the applicants admitted that local stakeholders were not consulted but couldn't explain how they wrote a report about a p-SIA that was never conducted. The auditors glossed over the attempted fraud during the audit. Distressingly, the audit report records that the auditors "verified the minutes of meeting conducted with local community on dates 7th March and 8th June respectively." This statement in the report must be evaluated in hindsight -- the auditors were aware that the applicants had not interacted with the local community and that the p-SIA report was largely fabricated. Yet, they chose to accept, as genuine, the records of meetings held BEFORE the audit. Why? We were not given a copy of the fraudulent p-SIA report or the B-EIA despite the requirement in the ASC Shrimp Standard that these reports be made available to stakeholders. The audit report further states that the auditors "verified the record of comminication of p-SIA to local community and stakeholders. Also verified the records of training conducted for the concerned person to make them aware about the p-SIA. Approved and Closed." This capricious stamp of approval on a critical indicator of the ASC standard is unacceptable. Should the auditors can be accused of innocently propagating the initial fraud by the applicants or should they be accused of being complicit parties? Your inquiries will determine if your auditors are naively credulous or poorly trained, or incompetent or actively fraudulent. 3) A local (who cannot be identified for obvious reasons) said that money was paid to those who "helped" with the farm getting certified. It was implied that members of our team would also be compensated if we "helped." This allegation cannot be proved, but we have reasons to believe it is true. 4) We discussed all these (and other) matters with the auditors. The audit report shows that our concerns were ignored. 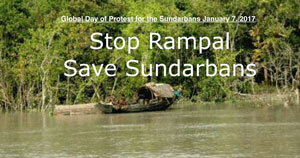 There were no efforts on their part to gain inputs from local stakeholders either. Their euphemism for their unprofessional abhorrence of field-work finds a place in their audit report: desktop review. They were happy to sit at a desk and be shown whatever paperwork the guidelines required them to see; this without understanding what they were supposed to glean from the paperwork. The non-compliance remarks in the report are part of a mindless tick-the-box auditing process during the course of which each non-compliance can be (and is) rectified with a tick in another box. This list, above, is not a full account of the problems we observed with the auditing process. It is excerpted from a report prepared by Nijera Kori. The report is part of a larger investigation of ASC-certified shrimp farms around the world. The incompetent farce (it cannot be called an audit) staged in Bangladesh throws into doubt all recommendations for certification given by the same team to other farms. We were shocked by their incompetence during the "audit"; far more terrifying is the squalid cover-up attempted in their draft-report. We recommend immediate suspension of certificates awarded to all farms audited by them, pending independent reviews by another CAB accredited to ASI. If the ASC's audit guidelines are to blame (as, indeed, they may well be) then all further certification should be suspended till these are rectified by the ASC's TAG. Nijera Kori and her partner organisations will continue to monitor the work of ASC's auditors and publish findings. However, it is for the ASC to act upon this information.